world famous 911/993 rwbWe are proud to offer a one off Porsche Carrera 930 which has been extensively recreated to the RWB 930 GT with a full 3.8 RSR engine. Here are some details of the modifications: PMO Carburetor 50π. Twin MSD. Air intake and exhaust manifold hole expansion. Export extend hole. Straight muffler. Attend oil cooler (inside bonnet ) SHACS Strengthen Clutch and 4 fin Racing Clutch. Strengthen Engine mount (Aluminium). Racing Tachometer, Racing Accelerator Pedal, Engine Rev Light, Full Roll cage, Recaro race seats, Engine Console（SW panel）Bucket Seat. 4Point Seat belt, Koyama Racing shock absorber, H＆R Suspension, 993 Turbo４pot Brake system（Brembo 315mmDrill hole type）915type: WPC processing Gear. 1.5wayLSD. Extend Oil Cooler (Inside rear fender), Short Stroke aluminium gearbox. The vehicle is outstanding and has unique presence with its crazy fenders and extra wide body, carbon bonnet and roof. 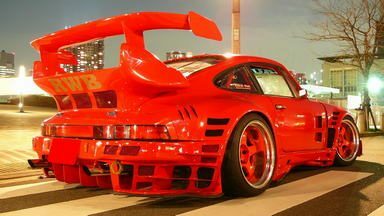 The exterior design has been styled by the famous RWB which consists of the wide rear fenders, RWB spoiler, RWB bumpers, front bonnet and decals. Its been featured in numerous magazines and officially won many races. We have lots of paperwork for further modifications and can be provided upon request and will be updated on the advert soon. Brian Harth 420 R Engine completely original. Newly revised with 300 hp.